Warren Gatland believes Johnny Sexton has his "mojo" back and can now fight for selection for the British and Irish Lions' first Test against New Zealand. Gatland and the Lions continue to remain coy over the chances of Sexton and Owen Farrell forming a playmaking duo at fly-half and inside centre for the first Test on June 24. Ben Te'o will take the 12 shirt for Saturday's Maori All Blacks clash in Rotorua with Sexton starting at 10 - but Farrell is on the bench and could easily join the fray in midfield. Sexton and Farrell joined forces to fine effect in the 12-3 win over the Crusaders after Jonathan Davies' head injury, and Gatland admitted that combination could be back on display at some point this weekend. "Johnny needs more rugby and we're building on that," said Gatland of Sexton. "He was really good off the bench against the Crusaders the other day and the combination of 10 and 12 was pretty seamless. "He was just down a little on confidence but he's got a bit of his mojo back, and we wanted to give him a start against the Maori." Sexton arrived on tour in New Zealand with just three Leinster appearances since January under his belt, owing to a string of niggling problems. The gritty fly-half struggled in the disjointed tour-opening 13-7 win over the Provincial Barbarians - but hit back to something approaching top form against the Crusaders. Sexton replaced Davies midway through the first half in Christchurch and looked immediately at ease with Farrell outside him at 12. 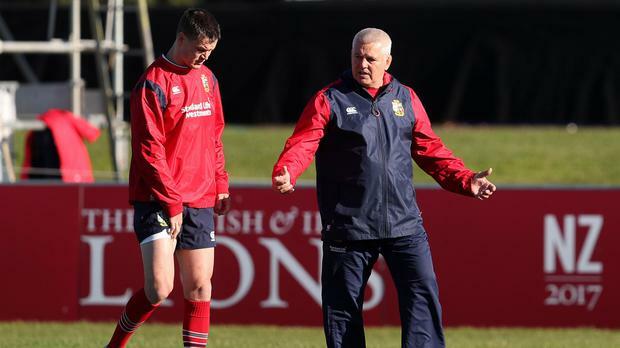 Gatland believes that run-out has settled Leinster star Sexton back into his natural rhythm and the Lions boss admitted he may pair up with Farrell again at some point in Rotorua. Asked if Sexton and Farrell could run in again on Saturday, Gatland insisted the Lions are still trying to keep the All Blacks guessing. "We felt Owen's had a bit of rugby at the moment," said Gatland. "He's on the bench and he's covering midfield options, so we could end up with the 10/12 combination. "For us, even though it's a strong side we've got to make sure we're not fully showing our hand. We've got to keep some combinations back and keep the All Blacks guessing a little about what the final squad might be." Wales star Leigh Halfpenny will start at full-back on Saturday in prime position to nail down the 15 shirt for the Test opening. But Gatland has challenged the Toulon flyer to hit his attacking best in order to force his way into the Test line-up. "It's an opportunity as well for him to show what experience he has got," said Gatland. "His counter-attacking and scoring tries has improved significantly, that's kind of what we need from a 15. "We know how strong he is defensively, but it's the attacking threat we're looking for him to add to us on Saturday."